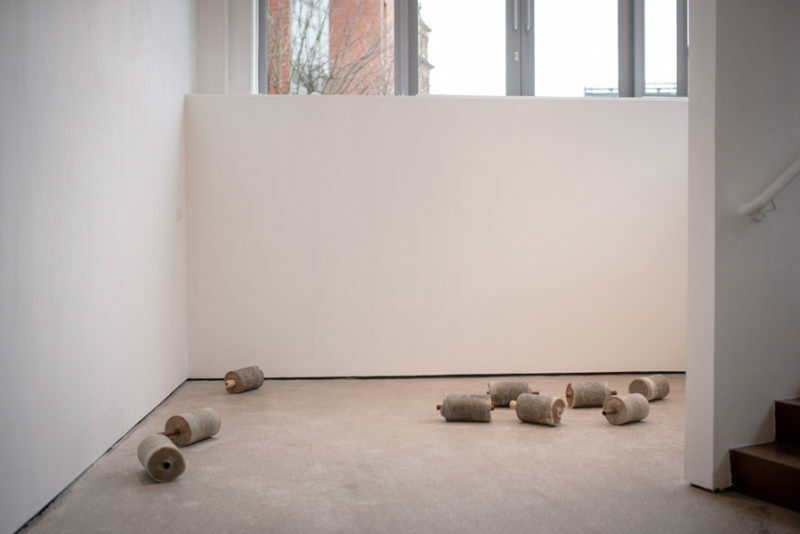 Co-commissioned by Castlefield Gallery and Salford University, multiple partnerships brought these new works into being: research residencies at the University of Salford’s Art Collection and Glasgow Women’s Library led to collaborations with scientists, technicians, local children, and ongoing conversations between the artists. Nothing was made in isolation. Relationships are key: the act of exchange unavoidable—antagonisms are activated to become productive, both in distinct artworks and across the show as a whole. The two bodies of work might appear at first unconnected, but after some time their whispered exchanges gradually build an oscillating dialogue: generosity and violence, present and past, presence and absence. Although the human body is merely glimpsed in Barker’s photographic self-portrait, ‘Speech’ (2018), it is ever present. In this diptych, the artist breast-feeds her child, eyes filled with combative anguish stare out between white marks: the images have been distressed. A larger portion is obscured in the right-hand frame, encouraging reading left to right: as a sentence, as time passes, as the new mother is erased from her creative/professional life, as her voice is silenced. ‘Speech’ seems to call out, over the balcony to the Leighton-Boyce works below: solid-looking sculptures resting on the ground. Cylindrical, alternately dull and glittering, they look like cement, like marble, like fossilised spools of thread. The visual markings on their surfaces are like veins, stretch marks, muscle tissue: they are meaty legs of lamb, their steel or ceramic centres bones. These bones protrude like handles, rendering them weapons. They are, in fact, salt. Salt heated to 801°C and put through a process based on bronze-casting, but, unlike bronze, if any water spilled on ‘Persistent Bodies’ (2018) they would dissolve: strength and fragility here align to symbolise the ephemerality of the human body, the light in us that fades. Salt by its nature contains contradictions. We need it to live, but too much will kill us. It is healing, cleansing, has caused wars. It is a preservative, but is absorbent and prone to alter in different levels of humidity. The process of salt extraction is echoed in both artists’ mining of archives and learning through layers of bodies, including through transitory relationships with people in different spaces. The notion of residue left after process is pivotal, physicalised in ‘Affinity’ (2018)—metal sheets that have been textured and marked by salt experiments. 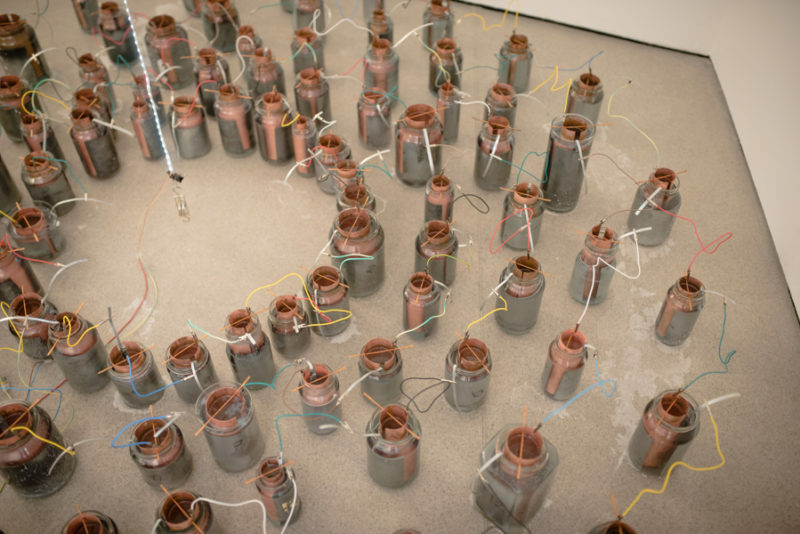 In ‘More energy than object, more force than form’ (2018), over a hundred glass jars of high-concentrate salt solution are lined with sheets of zinc and copper. The jars are connected by a meandering spiral of wires that can be traced inward to a string of LED lights that hangs down from the ceiling: the salt in this instance becomes an electrolyte, the combination of elements generates electricity and the jars in totality are a battery. Energy journeys through multiple bodies in a circle, a non-hierarchical collaboration, an ancient ring of standing stones, a visualisation of productive hermeneutics that both led to the show and play through it. Salt’s dynamism speaks to the child’s action in Barker’s work downstairs. The show transitions to a darker ritual in the temple-like subterranean gallery: a colourful rug lies before a statue, tapestries hang on each wall and meditative humming envelopes the space. Voices sound together, lose musicality and veer towards wails before receding: they are children playing ghosts, owls, now building again towards a siren sound, now falling away with tidal rhythm. This audio, ‘What sound should we make’ (2018), could be emanating from the round Os of the two masks on the floor, their mouths and eyes, tall walls and deep hollows. They are stylised, strongly reminiscent of African tribal art but cast in white plaster and covered in patches and lines of bright felt-tip that are mirrored around the room. This re-enactment of the whitewashing of history foregrounds both the fetishisation of African cultures and the erasure of numerous peoples from histories: in this centenary year of the Representation of the People’s Act it is clearer than ever how men, working class women and especially women of colour were written out of the suffragette movement. The masks also recall Duncan Campbell’s video essay, ‘It for Others’ (2013), which probes the ethics of western art markets and ownership, especially of tribal art, especially by institutions. It’s the child’s experiment here that perhaps offers hope: that the whitewashing of history might yet be re-coloured by the generations to come. In the centre of the room, packing paper stands: a woman’s legs and lower torso, scrunched into shape, unfurling onto the floor. ‘Her whole self’ (2018) is held with brown tape, scribbled over with childish lines of colour. Both the body and the child glimpsed in ‘Speech’ are almost present, their residue tangible: the brown-paper form is not woman but her absence; the child leaves their mark on the mother’s professional life, as a force for positive change. As in the self-portrait, it’s erasure itself that is challenged: the legs’ stance is powerful, the body’s absence working to reclaim a right to absence: protecting your own time, learning to live in the presence of the child. 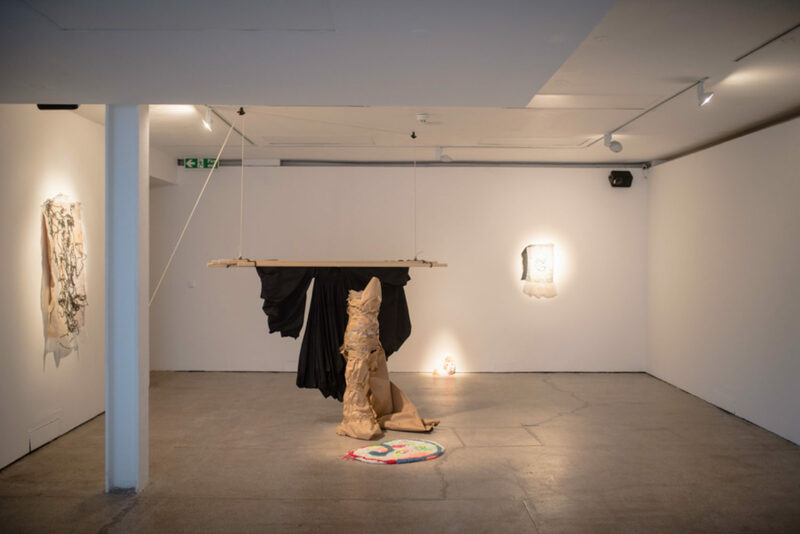 The juxtaposition of textiles here prompts a link with Louise Bourgeois’ fabric drawings and her own problematic relationship with motherhood, subtly commented on by Barker in ‘Thought Forms V’ (2018), which carries out the act of dulling: gold’s shine crowded out by a layer of white wadding, the sun shining through fog. The weight of women’s (unwaged) labour presses down, but the show manifests a defiance that harks back to the suffragette’s militant violence and damage of property. These works were commissioned for acquisition into Salford’s collection, but their salt will deteriorate. Barker and Leighton-Boyce have created work that almost isn’t, or soon won’t be, collectible property. As with the (woman’s) body, ‘you can’t buy me’, the work says, ‘you can’t own me’. These explorations through materials, communities, and numerous bodies are by turns painful and optimistic. Whether as a matter of fact or with hope, what the show continually dissects is mutability: that things (will) change.